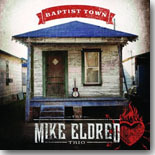 The Mike Eldred Trio headed to Memphis to record their new CD, Baptist Town, at the historic Sun Studio. The result is their best album to date, an easy choice for this month's Pick Hit. Our Surprise pick comes from acoustic blues standout John Long with his Delta Groove release, Stand Your Ground. This month's Flashback feature presents a collection of 1990 recordings made in Athens, Greece by Katie Webster, known better in her day as The Swamp Boogie Queen. Our What's New section features reviews of new CDs from The Mike Wheeler Band, Big Harp George, Big Jon Atkinson & Bob Corritore, Michael Doucet and Tom Rigney, Albert Castiglia, Diana Rein, Blind Lemon Pledge, Ivor S.K., Jewel Brown, Ivas John, and more.